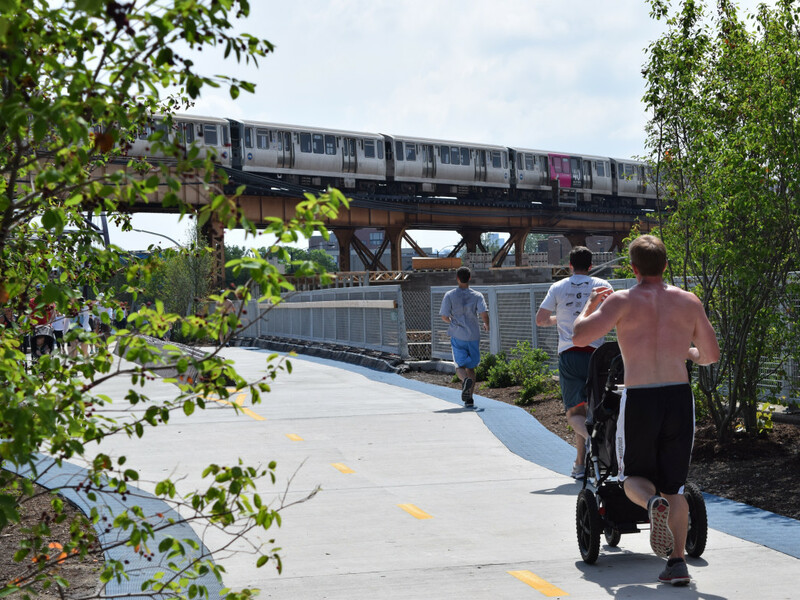 Chances are, you’ve heard of the new 606 trail that opened on June 6, covering nearly three miles of the old Bloomington rail line elevated above several neighborhoods northwest of downtown Chicago. 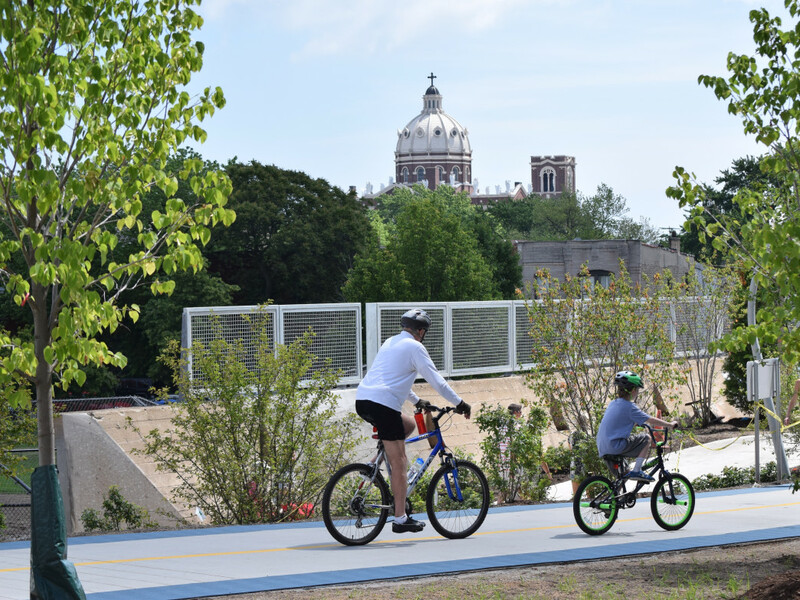 It has received plenty of coverage in the local media for its bold experiment in turning an elevated train track into a 20-foot-wide urban park that allows cyclists, runners and pedestrians to enjoy car-free transit across the city. 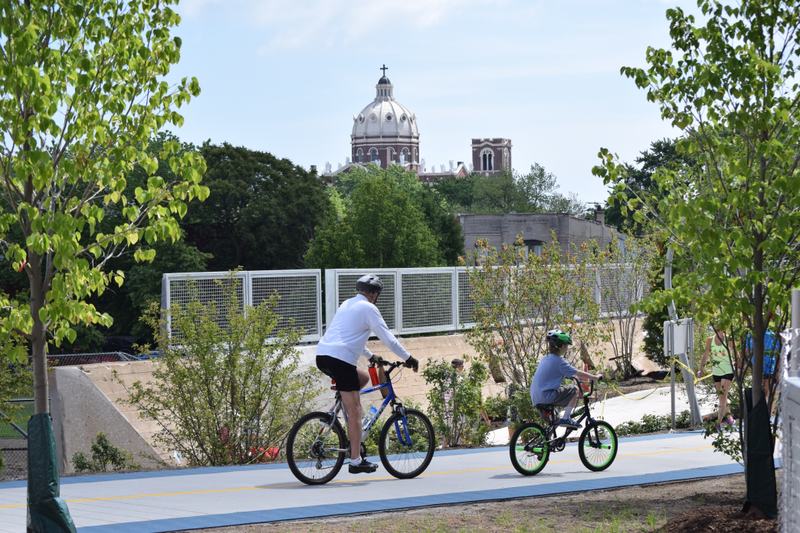 It’s already drawing rave reviews for its architectural charms and as a new recreational resource in neighborhoods definitely in need of more green space. 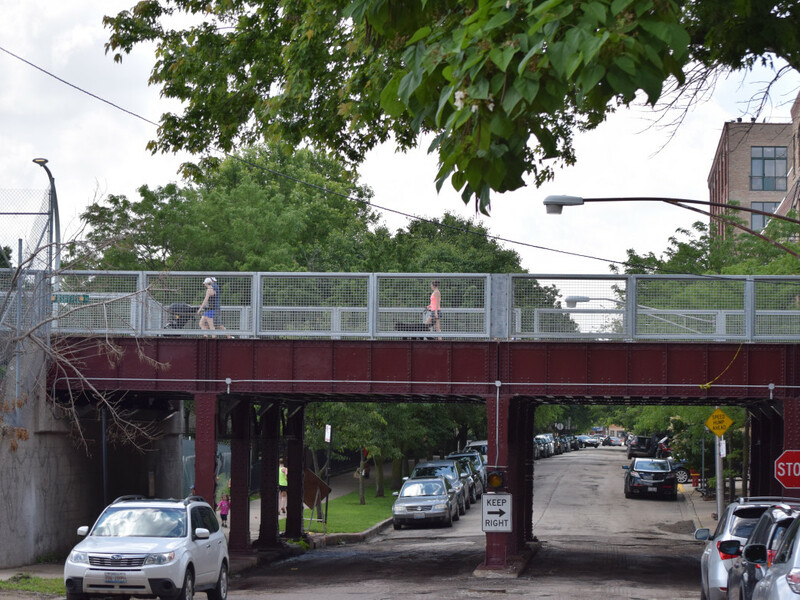 Stretching from Ashland Avenue in the east to Ridgeway Avenue in the west, the 606 covers about 2.7 miles in all, running parallel two blocks north of North Avenue. When you look at a map it resembles another el line. Which makes sense, as the elevation above the city streets provides a welcome way to travel east-to-west without dealing with a stoplight every block or two. About a dozen entry points allow users access to get on and off the trail. Named for the area’s zip code, the 606 serves the neighborhoods of Wicker Park, Bucktown, Humboldt Park and Logan Square. The trail has been in the making for the last 10 years, with the hope of turning the abandoned railroad right-of-way into a “unique urban green space uniting nature, science, and culture,” according to the city. That means the city has put great emphasis on public art and the trail’s connections to other parks and public institutions. It’s still a bit of a work in progress when it comes to the landscape design. At both ends, you’ll still find lots of dirt and construction equipment that that will eventually make two nice parks to bookend the trail. 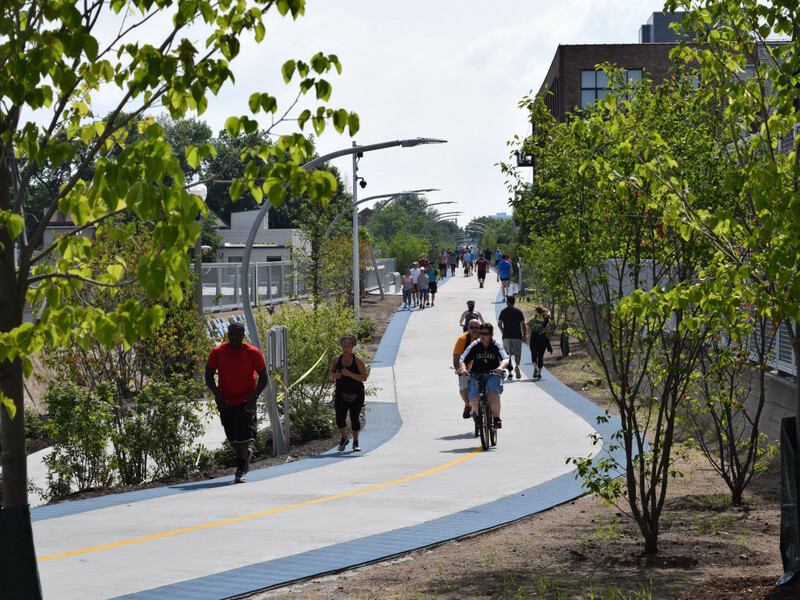 With all the attention the 606 has received, it’s no surprise that the trail is crowded, especially on the weekends, with walkers outnumbering cyclists and runners, although you’ll find plenty of those as well. But while the 606 is garnering plenty of attention for its unique way of putting an abandoned rail system to better use, how does the trail actually work for runners and cyclists? Let’s start with the positives, because there are plenty. The 606 is a beautiful trail, a concrete path the majority of the way with a dotted yellow line dividing east- and westbound traffic. On either side of the main trail is a narrow strip of a softer rubberized material, better for runners looking for a softer surface. Planners have done a wonderful job with an industrial design that fits perfectly into the neighborhood. Riding the trail you can’t help but wonder why more of these don’t exist? Elevated above the city streets, you're removed from the hustle and bustle 25 feet below. It’s surprisingly quiet, and the views of various buildings lining either side of the path are quite entertaining. It’s a similar view as when riding the el, but the much slower pace allows you to enjoy the different types of structures along the route. Condo owners must now remember to close those blinds, although that’s surely a better problem to have than a train rumbling past the building. You can see the effort that many people have put into beautifying their properties along the trail, and you can just imagine that Chicago magazine already has an article on the “Rooftop Gardens of the 606” in the works. Having the full route uninterrupted by traffic is something almost impossible to find within the city limits. Even the Lakefront Path has traffic crossings every so often. Elevated about the traffic without having to worry about preoccupied drivers really puts your mind at ease. Water is available on several points along the route, and plenty of signage keeps you aware of where you are and how to get on and off the trail. As for the drawbacks, most of them are the result of the landscape still being unfinished. Right now, there’s very little shade, but you can see that changing in the years ahead as the trees along the route grow bigger. Some of trail is lined with plants, but many sections are still just dirt, and the four parks along the route aren’t finished yet either. The crowds are a bit of drawback if you’re interesting in riding faster than 12 mph. But let’s face it, that’s really not what the 606 is about. This is more of a communal experience—getting together with neighbors to enjoy the city and enjoy your sport without the normal hassles. I expect 606 pub crawls and restaurant hops to become popular as people use the trail as a transportation alternative. Bike commuters on the west side will surely rejoice as this route makes their trip so much more enjoyable. And for those who don’t live in the neighborhood, such as myself? I see the 606 as a great destination for shorter rides and runs, with an added on visit to a coffeehouse or restaurant in the neighborhood. The 606 is certainly worth the trip to see what all the excitement is about.